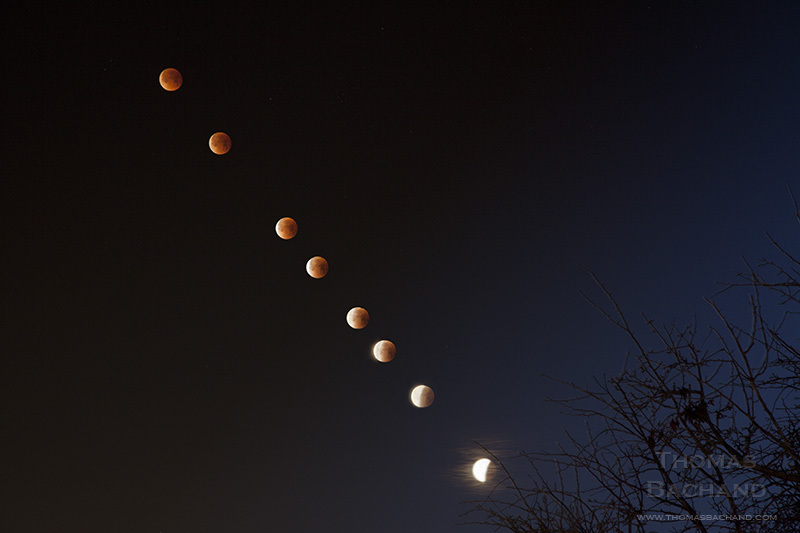 This sequence of a rare Super Blue Blood Snow Moon was taken on January 31, 2018 between 5:00AM and 6:40AM as the moon was setting at dawn. A super moon is the name given to a full moon occurring at the closest point to the earth in the lunar orbit. On the occasion when there are two full moons in a calendar month, the second is called a blue moon. A blood moon refers to the optical effect during a lunar eclipse, where only the red spectrum of light, filtered by the earth’s atmosphere, illuminates the lunar surface. A snow moon is a full moon that occurs during February, the middle of Winter in the Northern Hemisphere.